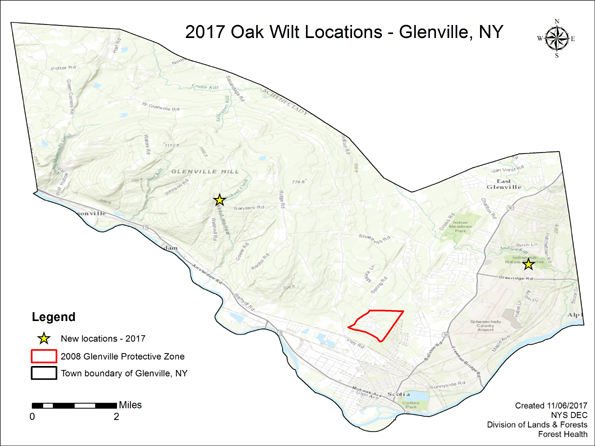 Oak wilt, a deadly fungal disease of oak trees, was discovered in two new locations in the Town of Glenville, Schenectady County. DEC staff conducting aerial surveys found one infection site. The other was reported by a homeowner. Digging trenches to prevent spread from one oak to another through roots. Prune oaks between October and February – NOT during the growing season when insects are active. 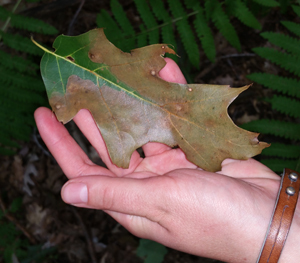 Oak wilt can be spread by beetles attracted to freshly cut or injured trees. Follow the rules of the protective zone. Sudden loss of a substantial portion of leaves during the summer. Use local firewood. Firewood can transport oak wilt and other deadly pests and diseases to new areas. Contact DEC's Forest Health toll-free information line at 1-866-640-0652 with questions, or email photos of tree symptoms to foresthealth@dec.ny.gov. Also visit DEC's oak wilt webpage.